PROBE is the departmental file server. It is a computer system run by the department where each BME staff member and student may have a limited amount of storage space to store files during their stay at BME. To gain access to PROBE please request an application form at the reception desk. Two drives, Q: and S:, are setup with PROBE whenever you log into a workstation (*); that is, the drives are 'mapped' to PROBE via the computer network. Q: is your home directory (i.e., your personal storage space.) Only yourself and the PROBE administrators have access to it. S: is the so-called 'share drive'; it is intended to facilitate file sharing between colleagues. Each lab has its own directory and use of the directory is lab specific. See your lab supervisor for details. File access permissions on folders within this drive may be customized. Because Q: and S: are mapped network drives they are available to you regardless of the machine you use (*). You may also setup access to these drives from machines not on Active Directory, outside of the department and laptops. Follow this link for instructions. (*): Provided that the computer is configured to be on Microsoft's Active Directory, as is the case for most workstations that are permanently connected to a network jack. The typical workstation on Active Directory uses 'roaming profiles,' meaning that a copy of your computer desktop (including, but not limited to, the My Documents folder and internet favorites) is kept on PROBE. This allows you to use different machines and have your desktop roam with you. Synchronization can take a long time when you have large files on your desktop. This translates to a long log-on time. PROBE is backed-up daily. Hence, the Q: and S: drives and your desktop are backed-up. Individual workstations are not backed-up. Follow the instructions indicated in File Access from Outside the Department. > Launch a VPN (Virtual Private Network) session. VPN: For instructions on setting up VPN see the McGill IT web site and search for "VPN". You may use Minerva to determine your McGill short username. In Minerva go to Personal Menu > Create/Change McGill Password. Alternatively, when at the department you may use your Q: drive to determine your McGill short username by clicking on My Computer, as illustrated in the figure to the right. Mapping a drive letter: Search the web for instructions on how to map a network folder or network share in your operating system. If you experience trouble mapping a drive debug the problem as follows. VPN: If you cannot establish a VPN session contact the Help Desk. Type \\probe.campus.mcgill.ca in the Address bar and execute. Type \\132.216.18.18 in the Address bar and execute. If you still get an error message then contact the Help Desk. Otherwise use whichever address works. Note that once the window to PROBE opens you may browse down to your home directory. Each user is provided with 5GB of storage space on PROBE. This includes files stored on the Q: drive as well as spaced taken up by the roaming profile (which is used, for one, to store files on your desktop). Please adopt the practice of managing your files to avoid wasting storage. Many labs have additional storage space on PROBE that is individually managed by the lab. Speak with your lab director to see whether your lab has such storage space. 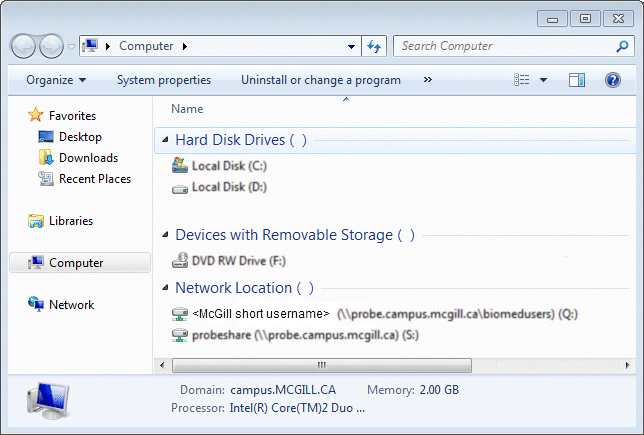 To recover deleted files from backup send a request to rcshelp [at] lists.mcgill.ca. The location of the file/directory to restore. Use the following table to specify equivalent locations on PROBE for the "Q:" and "S:" drives. The last known date that the file/directory was on PROBE. CLUMEQ is a research consortium for high performance computing (HPC). For more information click here. Report problems concerning the departmental printer(s) to services-bme [at] lists.mcgill.ca. Report problems concerning the public computer to services-bme [at] lists.mcgill.ca. Other requests for help should be directed to the McGill ICS Help Desk. Non-administrative staff (e.g., students, academic staff, etc.) should identify themselves as "Biomedical Engineering"
Administrative staff should identify themselves as "Biomedical Engineering Admin"
If your problem does not involve Banner, email, Minerva, wireless networking or myCourses, requests can be sent to rcshelp [at] lists.mcgill.ca for faster service. Email is a centalized service managed by McGill NCS. Please see the McGill IT web page for general information and instructions on how to setup an email reader. You are encouraged to use the Exchange Server email facility as it provides a unified environment to manage your email, contacts, calendar, and more. Moreover, you will be able to access these features via the web. Everybody at McGill has a mailbox on the Exchange server. Students should strongly consider listing their email address in the Exchange GAL (global address list.) There are two reasons for this. The Exchange GAL is the primary means by which administrative staff can lookup your email address. By not being listed in the GAL you make it difficult for staff to contact you. In order to be able to setup Outlook as an Exchange Server client you need to be listed in the Exchange GAL. Staff are listed in the Exchange GAL (global address list) by default. Note: When an email is sent within the Exchange platform (say, via Outlook setup as an Exchange client) to another user with an Exchange mailbox the email is deposited directly into the recipient's Exchange mailbox. There is no way of redirecting the email. As such, if you do not at least check your Exchange mailbox you may be missing out on some email. Staff may look into using EVault Archiving to free up their quota. Email placed in the archive can still be accessed from Outlook and the web. Though McGill NCS manages the campus computer network, requests for LAN jack installation, activation, etc., are handled at the department level. Please contact services-bme [at] lists.mcgill.ca for your computer jack needs. Documents may be printed on the color photocopier in the department. The photocopier is part of the uPrint service managed by the university. For more information on printing black & white and color copies point your web browser to the McGill IT Knowledge Base and search for uPrint. MATLAB is available for stand-alone installation for faculty, staff, and active Post Doctoral Fellows. Licenses are available through McGill Campus Site Licenses and are obtained individually. Send a request to services-bme [at] lists.mcgill.ca asking for MATLAB access. Include your McGill short user name. Include the name of your supervisor. Indicate whether or not you have access to PROBE. Wait for notification that you have been granted access to the MATLAB license server and, if necessary, to PROBE. You will also be provided with installation instructions. McGill IT Services provides Office 365 ProPlus at no charge to all students, and elligible faculty and staff members. This allows eligible people to install several MS Office applications on personal devices. See McGill IT KB article 5172 for additional information. See also McGill's Software License Center. Though each lab must purchase required products out of its own budget, some software such as reference managers and anti-virus are free to the McGill community. All of McGill University volume-licensed software is available at this site for downloads by faculty, staff, and students at their convenience. Wireless access is a centalized service managed by McGill NCS. Please see the McGill IT web page for more information. For a variety of reasons it is recommended that you do not lock your login session overnight. For instance, system maintenance may be performed overnight and your workstation automatically rebooted! You risk losing any open files. Workstations that are members of Microsoft's Active Directory automatically receive Windows critical patches. As such, your computer may be forced to reboot overnight. (This occurs only when a patch requires a machine reboot to complete installation. Users have no indication whether a patch warrants a machine reboot.) When a critical patch has been installed on your workstation an information bubble pops up from the task bar at your first login after the event. How updates are managed: NCS evaluates each patch released by Microsoft and selects which ones will be pushed to our workstations for installation. Not all of the critical patches are pushed down by NCS; for instance Windows Service Packs are not automatically installed though the more critical patches are. Just the same, it is good practice to occasionally check with Windows Update to determine whether there are any patches for your system. To prevent conflicts with other workstations on the BME network a computer needs to be properly configured. The ability to browse the internet or use the network is not an indication that your workstation is properly setup. If the machine is in the Duff building please contact services-bme [at] lists.mcgill.ca. Otherwise please contact rcshelp [at] lists.mcgill.ca. To add/remove a computer from Active Directory please contact services-bme [at] lists.mcgill.ca. By default workstations are put on Active Directory when BME Services connects a computer to a network jack.